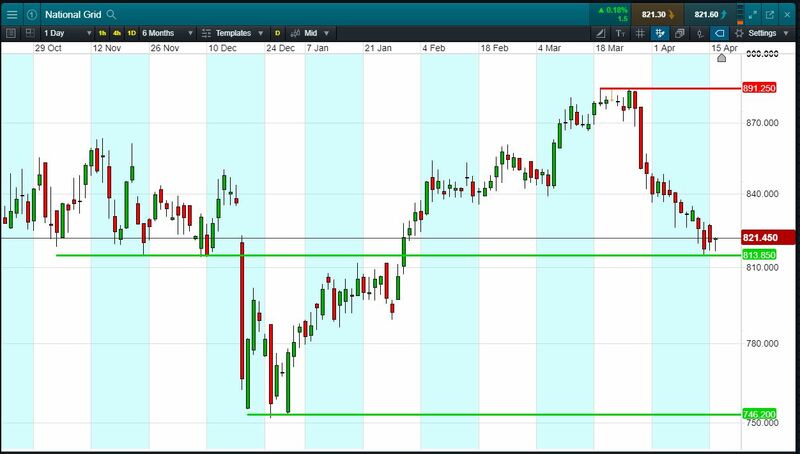 Will National Grid break support, or will it rise again back to highs of 891p? National Grid has intersecting support at 813p. Now trading 821p (at time of writing). Will the pattern repeat, the shares climbing back towards 891p? Shares -7.7% from 2019 highs; +10.4% from 2019 lows; +7.7% year-to-date. Let’s say you like the National Grid chart and you think the price is heading back towards 891p again. You decide to buy exposure to £10,000 worth of National Grid using a CFD, at the current price of 821p. To do this, you need £2,000. Let’s assume National Grid rises back to 891p (+8.5%). Your profit would be £850, from your initial investment of £2,000. Conversely, let’s assume you open the above position, and place a stop-loss at 3% from the current price. National Grid falls 3% and hits your stop-loss. Your loss would be £300.